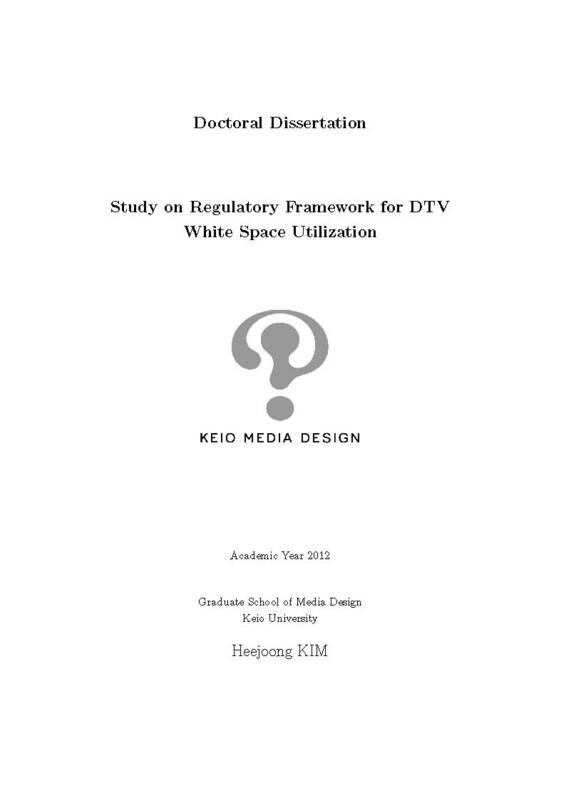 This thesis presents analysis on how and why a spectrum policy considering usability is needed for practical use of idle frequencies in digital television (DTV) band named as DTV White Space. Such DTV white space is lying in congested condition in aspect of physical condition and service content characteristics. Based on the traditional spectrum policies and a case study of DTV leading countries, an interdisciplinary approach is used to develop spectrum regulatory frameworks for introduction of new services to the public as one of approaches for efficient use of radio spectrum. In particular, the thesis suggests a need to review on DTV idle channels as public goods to balance their utilization as one of national resources. As such, rational and strategic approach is required to derive social consensus to introduce the DTV White Space through the comprehensive review. The thesis direction is focused on the DTV White Space utilization as public goods, and the policy direction has been presented in public side. At first, a literature review was conducted to investigate the policy trends for radio spectrum policy and the new wave for enhancement of spectrum usability due to the DTV transition. Second, a survey on the present condition for the DTV White Space policy was performed to show the research motivation and efficacy through the case study on DTV leading countries such as United States (US), European Union (EU), and Japan. Two hypotheses are implied in this thesis; the user classification and the narrow band application for the successful launching of DTV White Space service under congested idle space condition. For the verification of hypotheses, three methods are adopted such as computing, in-depth interview, and laboratory test. Such methods verify the hypotheses in terms of technology and policy aspects. Computer simulation was conducted to estimate the quantity of idle spaces for DTV White Space users based on the DTV transition channel plan at three pilot areas in Korea as an example of severe condition for using DTV idle channels. In parallel, the in-depth interview to the experts working for the stakeholders, government, and the academic field was performed to study various opinions and presume an appropriate service content to derive social consensus. Based on the in-depth interview, the terrestrial truncated radio (TETRA) was selected as an applicable DTV White Space system. Moreover, the laboratory testing was conducted to estimate appropriate operational ranges for DTV White Space users, and to show advantage of narrowband applications in aspect of DTV disturbance by comparing a wider band system to the targeted narrow band system. Presented results were reflected as one of regulatory guidelines for DTV White Space management in the technical aspect. The practical significance of this study is that it proposes a reference to alleviate the burden of spectrum regulator via profound understanding of the current situation in the government and stakeholders through the consideration on service contents and technical feasibility. Consequently, the radio coexistence and management directions will be on the domain of policy and technology for the introduction of new radio services in DTV band.